My family, from back since when I was a kid, often didn’t have money for presents. Sometimes we would hand-make presents, bake goods or make coupons for favors like “I will make your bed for a week” or “Do your chores.” One Christmas we didn’t even know if we would have electricity…much less a tree. A nearby tree lot donated a tree to us, they even dropped it off at our house, after my little brother went over and gave them a sad-faced orphan look. Many Christmases were just like this. One Christmas Eve, we sat in the dark and just told old stories about our family origins and more recent memories. Each of us also wrapped up that ‘something special’ that we wanted our loved one to have. To this day, it is still the best Christmas I can remember as a child. Today with my own children, I find it is better to just keep it simple. Both of my children have a hard time with sensory overload. They really don’t need all the chaos and pomp and circumstance, it’s all too over stimulating anyway. I find that ASD parents seem to struggle with this concept every year. 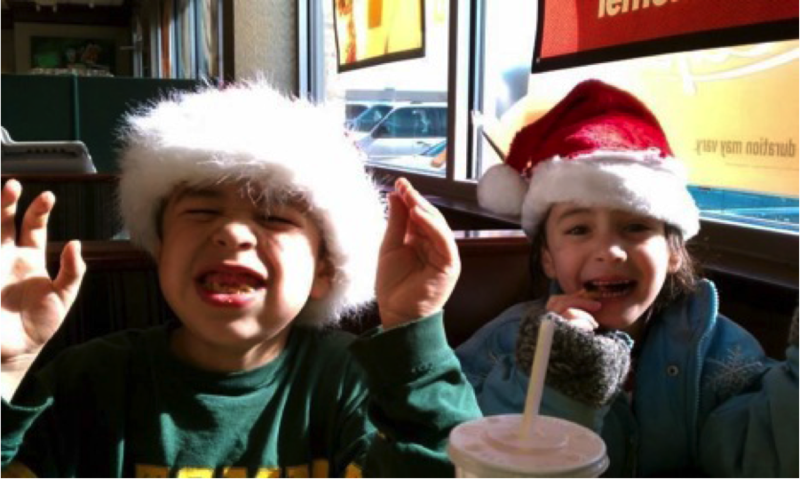 Parents in general try to recreate their childhood memories for their own children, but in an ASD parents case, maybe it’s best that we just let the kids direct their own Holiday experience. It’s not that my husband and I don’t give it all a good college try. When we do, it takes more planning than a formal wedding for it to be a success. Sometimes I feel that we as parents stress ourselves out trying too hard to make our kids have that special holiday when all they really want to do is simple every day things. Paint a picture with them; tell them a story about your childhood memories; help them make a present for Dad or brother. These are the memories they will cherish the most. There is no law that says we HAVE TO make our kids visit the Department Store Santa. You know your child better than anyone. You know what they can handle and what will be a challenge. If it is going to cause undue stress into your’s and your child’s life, be creative and think of an alternative. I wonder. Why hasn’t someone created a website where your child can visit Santa by Skype or video chat. Wouldn’t that be something? And it makes more sense that the REAL Santa is too busy up at the North Pole to spend all his days at the Mall, right? Christmas has become way too commercialized anyway. Why don’t we blaze the trail for a more Simple Christmas? I believe we would all be the better for the shift in our thinking. Have a Happy and Stressless Holiday! Katherine Goodsell M.ED is the mother of two amazing children on the Autism Spectrum. Her children were the catalyst that started her journey down the road of Early Child Development and Education, Developmental Disabilities and Autism Spectrum Disorders Advocacy.In a 25 year span, Katherine is proven as an effective and culturally sensitive Life Coach; a capable director of resources and designer of Behavior plans and individualized educational plans (IEP) for children with developmental delays.